"You never know who you might meet on a bicycle tour. That person may change your life. They might make a comment that enlightens you or disturbs you. At the same time, you might inspire someone without knowing it. Or, some person may jump into your world for a moment and jump out just as fast. "Condor" chatting and devouring an ice cream cone. As usual, Gerry told a few of his Irish jokes while Don and I stood by him, laughing. A man walked up. "Are you the owner of this bike?" he asked. "Is that your sign on that bike about riding from the Pacific to the Atlantic?" "Are you really bicycling from the Pacific Ocean to the Atlantic?" he asked. "That does it," he said. 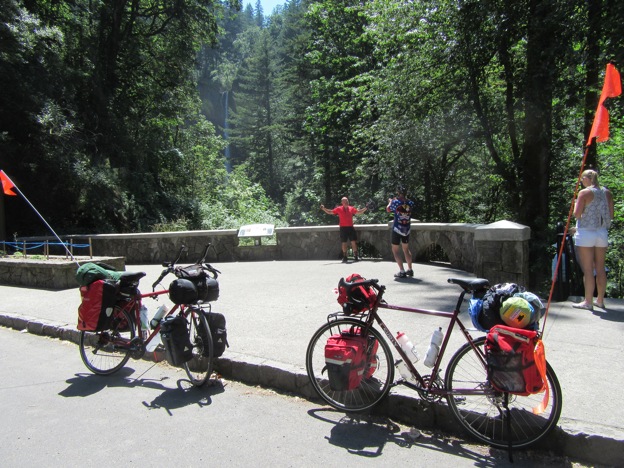 "I've been thinking about riding my bike across America for more than 20 years. You've just given me the courage to do it, too. I'm going to ride across America next summer. I'm not going to waste another summer of my retirement. Thanks for giving me the courage." "Gosh, you're welcome," I said as he shook my hand and walked away. Quickly in the morning, the Adventure Cycling crew packed up and headed out. Last to go, the cook, Kolianna dressed up in her bicycle garb and swung her leg over the top tube. "Thanks for the veggie dinner," I said. "Thank Gerry for his guitar playing and great songs around the campfire last night," she said. "That was a fun songfest." "You're the best," I said. "Happy travels." "Same to you guys," she said, as she pedaled up the hill toward the highway. In an instant, she left our lives. In an instant, she moved onward into her own life. She's one of those wanderers who loves adventure more than comfort, more than security and more than the constancy of day to day living at home. We ate breakfast, packed and headed eastward into that vast wilderness of the Columbia Gorge. Sheer, unadulterated beauty surrounded us all day long. We rolled high on the valley ridge only to descend back down along the river. 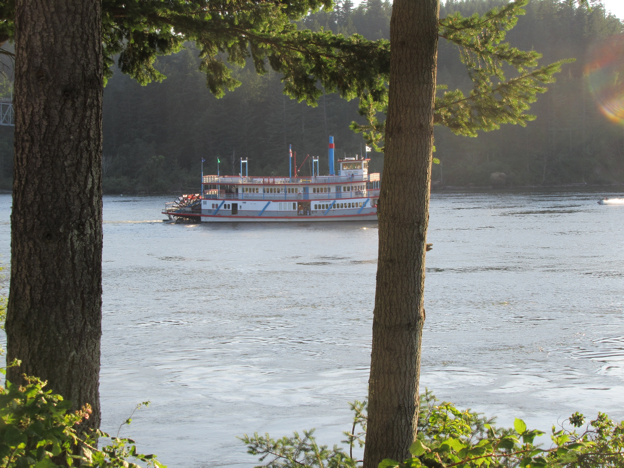 Always the sparkling waters of the river! Always the eternal green of the trees! Along the way, flowers lilting in the breezes and reflecting their colors with the blazing sunshine! Yellow, blue, orange, white, red, topaz, purple, pink, and more! Emerson said, "God laughs in flowers!" God seemed to laugh along every mile of our journey! Above, hawks soaring in the sky, and in the meadows, deer grazing on summer grasses! At one point, we pedaled through a cherry orchard. Tons of cherries grew on the public highway domain. We grabbed fresh, juicy cherries right off the trees. "This is a bonanza," said Don. "Maybe we could set up camp here," Gerry said. "And eat ourselves into cherry heaven." "Too early in the day, dude," I said. Near the end of the Gorge, the paved path turned into a steep cement stairs. 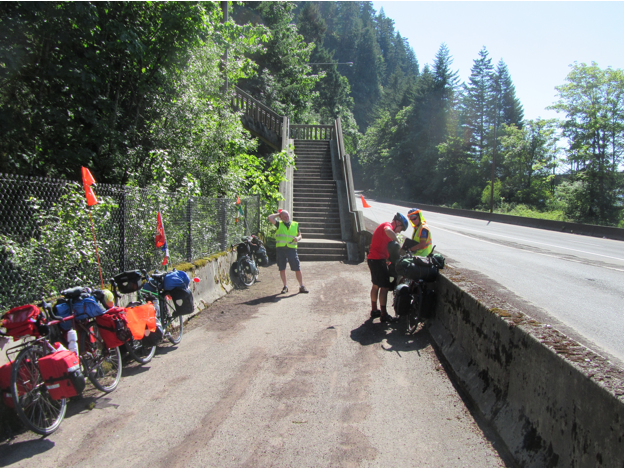 We had to unpack our bikes and carry them down the steps. Some of us helped each other to make sure we didn't drop the bikes. After some arduous step-up climbing and down-climbing, we set the bikes back up on the trail. Near the end of the day, we rolled along some sheer cliffs high above the river. The terrain showed massive brown cliffs with deep drops into small canyons. Picture taking paradise! 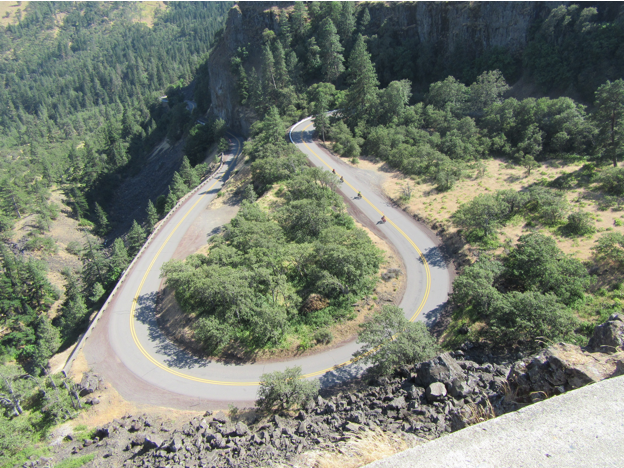 At the end of the ridge, an overlook parking lot showed a fabulous horseshoe road below that wound downward toward the next small town named "Dalles" which meant ‘small ripples' on the river. We still rode along Historic Route 30 of the Columbia River Gorge. I directed everyone to position themselves on the highway to ride into that horseshoe bend for the video and camera shots. "It's daylight, we ride!" said Don. They flew around the back edge of the viewpoint to make their way into the horseshoe curve. I snapped some fabulous pictures of their descent. After taking great videos and pictures, I jumped on my bike for the ride down into the horseshoe. I must hand it to the engineers of the Columbia River Gorge: they created an extremely beautiful and non-evasive road through stark wilderness that stuns visitors with its beauty to this day. Just imagining those brave 33 men on their Corps of Discovery journey astounds me with their courage, their tenacity and their bravery. It seems every era features a Captain Cook who sailed around the world his entire life. Or, Sir Edmund Hillary and Norgay Tensing who conquered Mount Everest. Or, Amelia Earhart who flew the Atlantic solo and attempted to fly around the world! Or the thousands of unknown men and women climbing, bicycling, sailing, scuba diving, rafting and proceeding through their lives with the same intent of discovering the world on their own. It's pretty heady stuff to explore the world during your life. Right now, if you're reading this history of our journey, I hope you gain something from the spirit of adventure. I hope you are that man or woman who steps up to talk with us, and then, decides to embark on your own adventure around your state, country or the world. You might like to backpack the Colorado Trail, or Pacific Coast Trial or the Appalachia Trail. You may decide to climb all the 14ers in the USA. You might scuba dive the Great Lakes or the Gulf of Mexico. Or, perhaps kayak the great rivers. How about canoeing the Mississippi River? It's there for you. Adventure awaits you! Answer the call in your own way. We rolled into Dalles for camp. Dinner never tasted so good after so much climbing and descending. "Good day today, boys," said Don. "A very good day," said Frank. Have you ever sat by the campfire? When the wood has fallen low? Around the campfire's crimson glow? That makes the spell complete. With your face toward the fire?